In this book Goleman has created an encyclopedia of emotions: what they are, how they are created, how they are formed, how they go awry, and how they may be brought back into line. 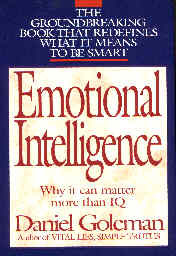 I began this book because of the work I'd been doing with Doyle P. Henderson on his theory of emotions. His theory describes how emotions are created and how to remove unwanted emotions. I wanted a complete background in the current state of knowledge about emotions. I found exactly that in Daniel Goleman's book, in a well-written, well-researched, and well-referenced format. The first breakthrough came when I encountered Joseph LeDoux's work on the amygdala on page 17. LeDoux had destroyed the neocortex of an experimental rat and exposed it to a tone and a shock. When exposed later to just the tone, the rat became very excited, even though there was no neocortex to record the original or the recreated tone. Something else must be recording and recalling the tone. There must be a separate parallel circuit for pattern recognition of tones, which also provided storage and recall of associated memories. That circuit was through the thalamus to the amygdala. LeDoux's work showed that the amygdala could record the substrate of primitive body states that underlie emotions, and play them back by associative recall. This almond-shaped structure of the limbic region of the brain stem is apparently the repository of all emotions and feelings that are experienced by the higher mammals, including human beings. In Henderson's theory, emotions in adult humans are generated by the automatic re-triggering of primitive body states that were stored before five years old in the human child. After the age of five, events that the child experiences are no longer stored as primitive body states or doyles, but instead as conceptual memories. (1) As a baby, one can only experience pleasant and unpleasant sensations in one's body , rather than recall them entirely within one's brain using images, sounds, and concepts of good or bad, which capability has not developed. As one grows older, one learns to talk, to understand speech, to recognize people visually, to recognize smells, tastes, etc. This complex ability to store and remember, which subsumes auditory recall, speech, visual recognition, gestures, tastes, smells, re-call of primitive body states, and much more, I call conceptual memory. (2) Doylic memory is pure primitive body state storage and re-call, nothing more. Conceptual memory includes the ability to recall full-blown primitive body states, to re-create them from doylic memory as soon as any associated stimulus is experienced. The ability to remember conceptually is mostly under conscious control, but the doylic memory is automatic. It is mediated, I posit, by the amygdala in the primitive brain, and is not normally accessible to conscious control, up until now. Up until Doyle Henderson's theory, which provides a dependable mechanism for accessing doylic memory, which changes it into conceptual memory, thereby removing the automaticity of the underlying physical body states produced by the amygdala. Others have done this with some success, but lacking the basic theory that this theory provides, the successes have become fads and then faded away. It is apparently in the amygdala that pre-kindergarten body states are recorded and later (3) triggered upon presentation of an associated stimulus to the amygdala. Evolving long before the neo-cortex, the amygdala had the job of remembering events that occurred to our primitive ancestors so that they could react instantly to their environment. As the neo-cortex evolved, a more comprehensive form of memory evolved which we call conceptual memory, and the function of the amygdala remained as a very fast response time associative memory. When an event occurs to a human in later life that has a component of it that is similar to an event before seven years old, the primitive body state stored in the amygdala is re-created by the amygdala as a full body state, which is the only way the amygdala can remember. It does this by associating now with then and re-creating the then state now. This is the etiology of emotions as I theorize it to be by combining Henderson's and LeDoux's work on emotions and the amygdala. The amygdala can be considered as the "doyle-house", the storehouse of those automatic body responses we call emotions or feelings. My thanks to Daniel Goleman for helping lead me to this understanding via his fine book. Nothing in Doyle Henderson's theory pointed to the portion of the brain that generated emotions, in fact, he avoids to this day any mention of brain structure or function. Nothing in LeDoux's work pointed to a method of converting amygdalin memories into conceptual memories as a means of removing unwanted emotional responses. Together one can see the evolution of consciousness: From the primitive amygdalin memory of the Neanderthal (early hominoid) to the refined conceptual memory of the modern human. Today's human can do things the Neanderthal could never do (7), but has an emotional brain that functions exactly as the Neanderthal's did. Thus a human today can act as a Neanderthal or as a cultured person, or anywhere in-between in a given circumstance. The exact behavior is determined by how one was raised into adulthood and what happens in adulthood with the automatic responses that were stored during the Neanderthal period of development known as early childhood -- before the age of five. To the extent the modern human converts one's responses into conceptual memories, the automatic responses disappear. To the extent the modern human does not convert one's automatic responses into conceptual memories, the unwanted feelings and emotions of its Neanderthal past will continue to plague it. As George Santayana said, "One who does not understand the past is doomed to repeat it." One can read him as saying, "One who does not convert the primitive body states of one's childhood into conceptual memory is doomed to have unwanted body states continue to arrive indefinitely." A second breakthrough came when I discovered the connection between emotions and the immune system. My first clue came on page 166 where Goleman describes how Robert Adder discovered that giving an immune suppressant drug in saccharin water created a primitive body state memory in those mice. What he found was that later doses of plain saccharin water would cause a depression of their immune functions as strong as the original medication. This is an example of evidence that is appearing more and more frequently that proves what many holistic healers and medical doctors have intuited for years: The immune system can be affected by memories of events that had happened previously to a person. And just as pain-based memories can act as stressors on the immune system automatically depressing it, so also can pleasurable memories act to enhance the immune system response (8). Since the triggering of memories of the previous course of a disease before the age of five can occur (by the associative recall function of the amygdala) during the early stages of the disease, when that happens, the aches and pains, that are recalled and thus recreated in the body, stress the body and suppress the immune system. Thus the immune system is suppressed at exactly the time it should be going into full operation. It's like, just as you press the accelerator to drive up a hill, your car's carburetor gets a signal that a fire is in progress, and shuts down the fuel to stop the fire (due to a memory of a previous fire). Your progress will obviously stop. In a person's body the bacteria or viruses will stampede in the absence of a strong immuno-suppressant response and the illness will run its full course. Understanding this, one with the early symptoms of an illness or disease would best do a trace and erase of the symptoms using Doyle's theory. Any doylic components of the symptoms will disappear and will not be around to suppress the immune system. This the process I call "getting a Panacean Shot". It allows one's immune system to combat the disease in its early stages, and, without the suppression from the stress of memories of previous bouts of the disease, to create a shortened, perhaps un-noticed run of the disease. A minor fever lasting half a day versus the more common ten-day bed-ridden course of the flu. Studying the biochemistry of the angry person is like looking at the damage done by a rampaging bulldozer instead of teaching the person how to drive the bulldozer. Cognitive therapy is like teaching the person how to dodge the out-of-control bulldozer to reduce the damage, so that, maybe, after a lifetime, one can reduce the damage to acceptable levels. On page 214 he says, "Emotional learning is lifelong." While that may be true, having a tool to provide quick relief to problems will be welcomed by most thinking persons. Doyle Henderson's theory, which is apparently unknown to Daniel Goleman, teaches one how to operate the bulldozer of their emotions quickly and effectively so that the bulldozer is used in an individually productive fashion from now on. 1. I have named them "doyles" after their creator. The reason for a name is to avoid the endless repetition of the phrase "primitive body states" which refers to the physical substrate of all feelings and emotions. The choice of the word "doyle" is to honor the creator of this theory. Return to text at footnote 1. 2. The above sentence does not make it clear when these various capabilities "come and go." For clarification, it must be noted that the conceptualization capability isn't completely developed in the average person until circa age five. Incidentally, Doyle Henderson believes that autism is the premature development of conceptualizing capabilities. These bright kids turn many of their earliest physical memories into conceptual ones shortly afterinfancy. Then, they manifest what seems to be an extraordinary capability to remember early life events, like the seven year old boy who tells his doctor he recalls getting a shot when he was a baby, and the doctor smiles and asks, "Where did you get it? And the kid says "Right here, in my heel." And, the doctor says "Right, how did you know that?" And the kid says, "I remember it well." With the very early onset of conceptual memories, autistic persons may have an extremely limited set of physical body states, which they spent the rest of their repeating over and over, like the 15 year old girl I knew that spent her entire day rocking back and forth on the driveway. Return to text at footnote 2. Return to text at footnote 3. 4. The mechanism that alleviates the heightened responses is likely the triggering of a calming body state by the amygdala once the new inputs are processed that indicate the absence of a threat. The neo-cortex is always behind, knowing it after it happens, after the body has already responded. Return to text at footnote 4. 5. Normal, meaning non-autistic. See earlier footnote on autism. Return to text at footnote 5. 6. The evidence for this is that in hundreds of cases of doylic traces, removal of the offending physical body state was not permanent unless the initial event was traced to before the age of five. One can only guess as to why this is so, up until now. Return to text at footnote 6. 7. This is so because today's human has experiential knowledge, which requires conceptual memory. The ability of today's humans to create a body of knowledge for future humans is what Alfred O. Korzybski called "time binding" in his book, Science and Sanity, which laid the foundation for the science of General Semantics. Return to text at footnote 7. 8. "Let Mommy kiss it better." is just such an enhancement. And if it happens before five years old, then it becomes a resource for the rest of one's life. Return to text at footnote 8.